Sarkari Yojana » Central Government » Pradhan Mantri Yojana List » Driving Training Centre Scheme for Driver Skills & Employment by Central Govt. 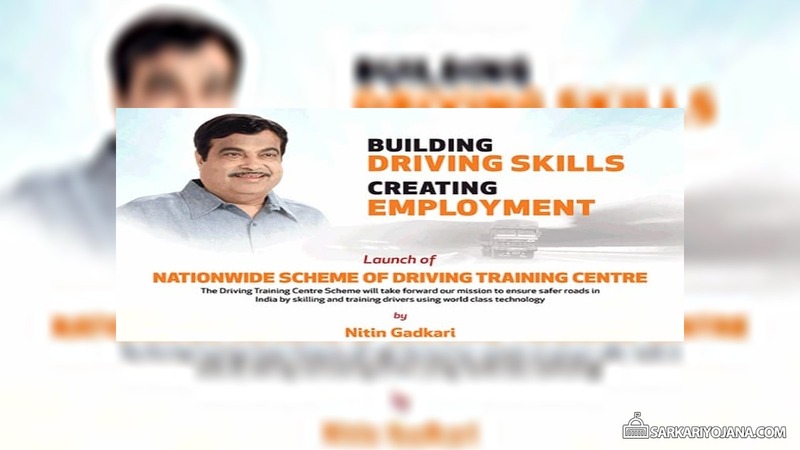 Driving Training Centre Scheme for Driver Skills & Employment by Central Govt. Central government has launched Nationwide Driving Training Centre Scheme for Drivers. Subsequently, DTC scheme will carry forward the mission of govt. to ensure safer roads in India. Accordingly, govt. will focus on enhancing driver skills and create employment. Moreover, govt. will also provide training to drivers through the use of World Class Technologies. Central govt. will operate this scheme till 31 March 2020. Under this scheme, govt. will set up standards and also monitor driver training. In addition to this, govt. will now issue Driving License on the basis of an objective scientific process of testing skills. Central govt. will provide financial assistance of 50% of Project Cost (upto max Rs. 1 crore) to open Driving Training Center. 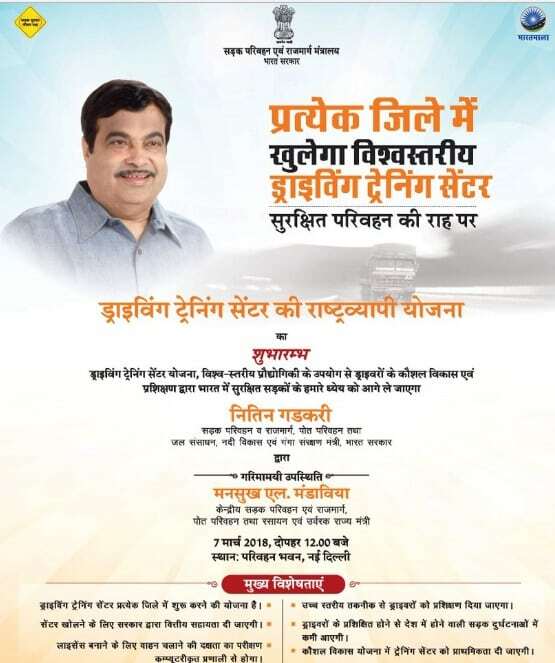 Union Minister, Nitin Gadkari has launched this scheme on 7 March 2018 at the Transport Bhawan, New Delhi. 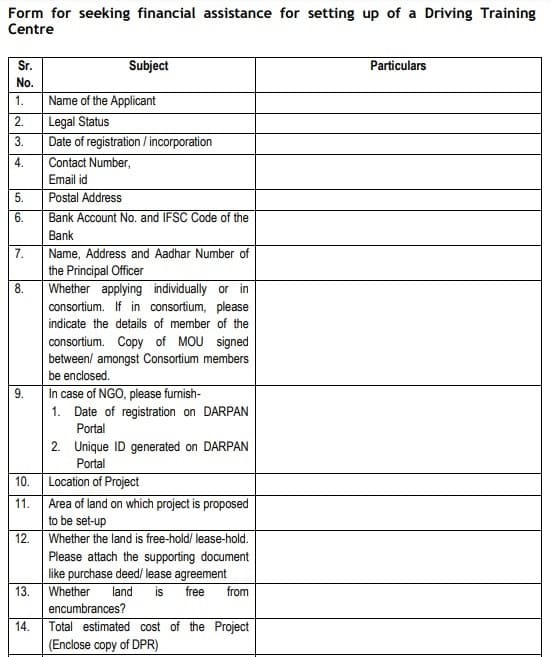 Ministry of Road Transport and Highways is inviting application forms for DTC Scheme. All the candidates will have to fill the application form to get financial assistance for setting up Driving Training Center. Moreover, candidates can also download the Authorization Certification for DTC Scheme through the official notification as specified above. Furthermore, candidates must submit these application forms in the specified timelines to seek financial assistance. To provide financial support to private participants for setting up of Driving Training Centers. Accordingly, to provide high level training to commercial vehicle drivers to improve roads and environment safety. Driving Training Center (DTC) is a skill development initiative which consists of physical infrastructure (land, simulators, vehicles, workshops). Under this scheme, govt. will provide skill training compatible to the standards of National Skill Qualification Framework (NSQF). Central govt. will make use of latest technology like Driving Simulators for driver’s training. Subsequently, DTC Scheme will consists of driving tracks with sensors. Accordingly, trainees can mark their attendance through use of Biometric System. Under this scheme, govt. will use Light Motor Vehicles (LMV) and Heavy Motor Vehicles (HMV) for training purposes. Moreover, govt. will provide financial assistance to open Driving Training Centers. However, priority is being given to open training center in Kaushal Vikas Yojana centers of the government. Furthermore, RTO can use the nearest center to test the skills of a driver before grant of Driving Licence (DL). The last date to submit first set of applications is 30 April 2018. Central govt. will give approval to the beneficiaries before 31 May 2018. Afterwards, candidates can fill the form regularly on the quarterly basis. The last date for filling application form is 30 November 2018 as it will take around 1 year to complete the project. All the candidates will have to complete the project till 31 December 2019. The last date to obtain the financial assistance is 31 March 2020. — For complete details of Driving Training Center Scheme, please see the official notification as specified above. Do anyone one know to whom we have to submit the application form.